"When high quality used processing and packaging equipment is required, Griffin Machinery Supplies is always our first call. GMS have been able to supply the specialised equipment that we have required for both new projects and existing production lines every time over the years. Not only do they offer a fast delivery time and a massive saving against the cost of new equipment. but have also proven to be a supplier that we can trust and rely upon." L. Johansson, Sweden. Meat products. "As an exclusive supplier of meat products to McDonald's in Sweden and Finland we obviously demand the highest standard from all of our suppliers. We are certainly very satisfied with the service we have received from GMS over the last few years." "We are Norway's largest meat slaughter and processing organisation. We have both purchased from and sold industrial equipment to Griffin Machinery Supplies and are very impressed and satisfied with the quality of service that we receive." "We are a large meat processing company which is 100 % owned by the REWE group and we specialise in the full range of sausage, ham and meat related products. Our speciality is the "Rügenwalder Teewurst. All of our products are manufactured and packed using the most modern equipment available to the industry. We have worked successfully for many years together with GMS International whose services have always been very professional and to the standards we demand." "We have worked for many years together with GMS International and have always been very satisfied with the service that we have received. Even in such circumstances where GMS have been unable to supply the machinery we require,they have always been more than willing to offer advice and have tried to point us in the right direction. When both buying or selling machinery GMS have always offered 100 % support and advice right through until satisfactory installation." "Griffin Machinery Supplies offer a fantastic service, we purchased for example a virtually new injector for our salmon production with a massive saving on price." "Höhenrainer Delikatessen can boast more than 30 years experience and we are the oldest processor of Turkey specialities in Germany. Even back in the early days at the beginning of the 60's, we based our success upon both trust and flexibility. 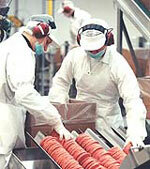 Today we are one of the largest processors of Turkey products. In April 2001 we first took contact with GMS International to inform them of our urgent requirement for a Multivac packaging system for one of our Turkey specialities. Within a four week period GMS had located and supplied the exact machine required. Today the machine is in daily production. GMS have saved us both valuable time and money."